Price of LG 24LN4100 HD LED LCD TV in India. 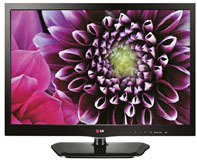 This model of LG HD LED LCD Television is with screen size of 24 Inch. Main features are USB Movie, MCI 100 (Motion Clarity Index), Triple XD Engine (Enhanced Contrast, Clarity & Colour), All round Protection.